A classic that has been a wardrobe staple for 100 years, trench coats are the perfect blend of masculine utilitarianism and timeless elegance. Harkening from the trenches of WWI, these coats have since appeared in everything from gangster films to Breakfast at Tiffany’s and have been reinvented over and over throughout the decades. Iconically chic, the trench coat exudes elegance, transforming even the simplest of ensembles. This wardrobe warrior somehow manages to pair effortlessly with any look and can be remixed again and again, regardless of the seasons and trends. With the trench coat’s centennial anniversary being celebrated this year, I’ve rekindled my love for this wardrobe classic. I especially love this Gryphon trench I picked up a few years ago — the khaki color is very militaristic but the feminine pleats at the back balance the masculinity well. 1. Color. What will you be primarily using your trench coat for? If your answer is everything and anything, choose a more traditional neutral color like tan or khaki. But if you’re looking for a classic piece with that special “wow factor”, opt for a trench in a bright color or more unique pattern. I suggest buying at least one classic trench before investing in a statement color trench. 2. Good Stitching. This goes without saying for any wardrobe staple. Take some time and really look at the quality of the stitching and of the garment in general. Is everything tight and straight? Tug on the joints (especially around the armholes) and make sure they are strongly sewn. Investing in a trench coat takes some time but since it is a staple, really invest your time into finding the right one — it will save you money in the end. 3. Fabric. Water-repellent is a must — trenches are first-and-foremost rain jackets! Also test out how well the fabric takes abuse by crumpling it in your hand firmly a few times. No one wants to look like a wrinkled mess after their morning commute. 4. Style. Double-breasted or single-breasted? Other features to consider are whether or not the trench comes with a removable lining, how the design and placement of the lapels are situated, and whether or not the coat has a storm vent. 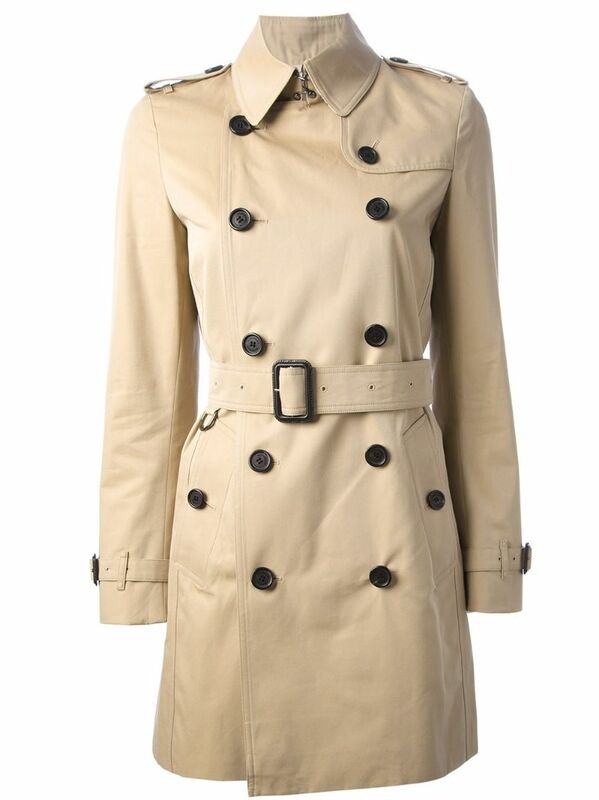 Many women’s trench coats have additional feminine details (like these pleats) to consider as well. 5. Length. Will you be wearing your trench with primarily pants or a dress? Consider how you will most often be using this wardrobe staple and then commit to finding one in a length which will compliment the existing pieces in your wardrobe. Since I am petite, I tend to stick with knee-length as longer coats appear to “swallow” up my short frame. Try some on, take some photos from different angles and decide what makes you feel the most confident. P.s. Trench Coats also happen to pair particularly well with another wardrobe staple: the neutral sweater.